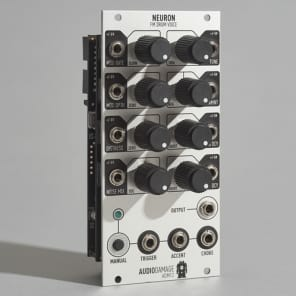 Like some other existing modules, Neuron is a Frequency Modulation-based drum voice. As with other drum modules of this sort, there are common functions built in to the module to tweak it towards percussion-friendly sounds. These drum synths are all essentially complex oscillators, each model using a different internal routing scheme to shape the sound. Each device includes Tuning controls (with some variations), simple Envelopes, Oscillator to Noise mix controls, and of course, Trigger inputs. 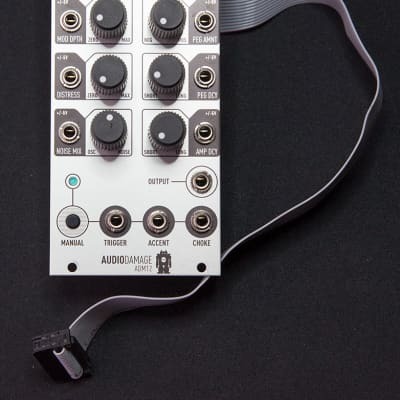 Neuron diverges from these other drum modules in the way that it handles the Frequency Modulation of the Oscillator. While other drum synths often use banks of Oscillators or Wavetables (collections of short cycles of different wave shapes) to generate percussive, complex signals, Neuron uses a single Sine wave as the modulator of a sample of a 909 kick drum. The result is an amalgamation of that classic, punchy 909 kick, with a lot of room for manipulation over the Modulator using the “Mod Rate” and “Mod Depth” controls. The Oscillator also fades to Noise using the “Noise Mix” knob to get snappier, higher frequency percussion sounds. Finally, the “Distress” knob seems to add some nice warmth and distortion to the sound.